We're at the end of the month, do you know what it means? 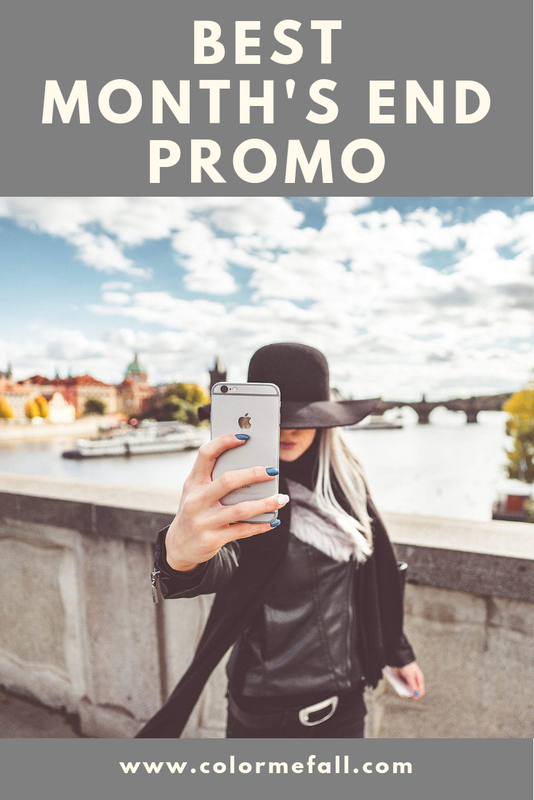 That today I'm gonna present to you the She In promotion! I've created some simple outfits this time so you could try to adapt accessories as you like, choosing the ones you prefer :) Are you ready to see them? I, for example, have chosen a casual look, with this cotton sweatshirt* - not elastic - which incorporates the bead pattern all over it. It has an asymmetric hem with a white contrast band and can be worn either tucking the front part inside the trousers or outside as in the case of leggings matching. Instead, I've taken classic high waisted jeans* with frayed edges. I really like the seams detail on the back which start from the pockets. Perhaps this is the outfit I prefer the most among those of today, together with the last you'll see later :) I've wanted to play on the vintage contrast of the cardigan* with the sporty style of the jeans*, completing all with a very simple thin sweater*. Here returns the beaded detail, tone on tone, and next to it we also find the only one button at the choker. There is in burgundy too but, off the record, I think it makes you seem older! This beautiful warm yellow, however, is really bright! The sweater is really simple just because I've wanted something super basic, so as to balance the two different styles and don't make any of them prevail over the other. The golden buttons on the forearms are the only detail of the item. You have at least one tartan item in your wardrobe, right? If it ain't so, I suggest you make it up right away, 'cause this kind of design is really stylish! It's able to give personality to even the most basic looks and is a passe-partout for your daily outfits. 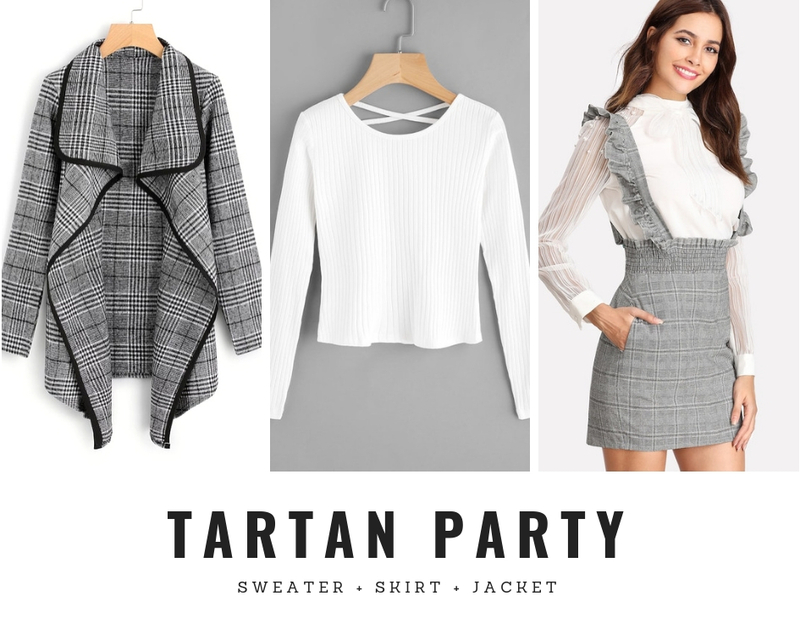 The plaid jacket* is definitely autumnal, but can also be used as a sort of cardigan for Winter! The waterfall neckline decidedly chic has no closures so it must be worn open. It's really suitable for office look too. The skirt* is unique, and takes the motif of the overcoat up, even if it's in lighter shades. Very preppy with its rouches on the shoulder straps and the pleating at waist, but the straight fit balances everything. The straps can also be worn down on your hips if you have a less basic top, but I've specially chosen a simpler shirt* which only has a criss-cross on the back. Another passepartout look, and I'm proposing again a waterfall overcoat* - did you realize I love it? aha! - with one difference: this one has laces at the waist as closure. It's available in a wide range of colours, so if you like it but you wanna change and opt for a grey one, an apricot or maybe windowpane check pattern, you can do it :) It's snug and quite elastic, suitable for both Fall and Winter under a coat! The skinny* is simple, not elastic so pay attention to the size chart! I've chosen it in black to emphasize the bodysuit* in this bright red: I find it really beautiful! In addition is slightly stretchy and comfy. It's absolutely the outfit I like best together with the "Sporty Vintage". Simple and stylish! I love it! I was undecided whether to pair it with a white tee or something fancy: in the end, I opted for a mix of the two! The printed shirt* is really cute and can be easily matched in many ways, as well as jeans*, adaptable for different occasions. It isn't stretchy and it's plus size, so check the size chart out! 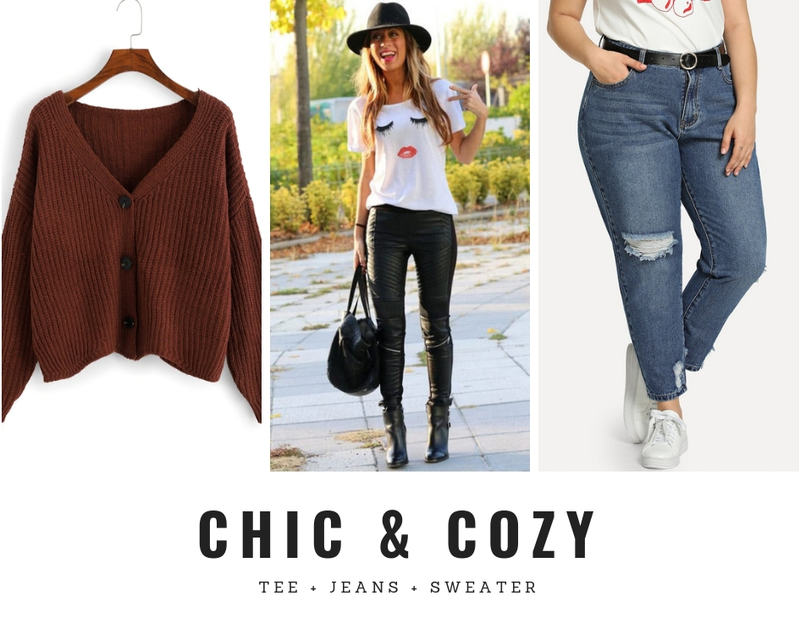 The cardigan* is the highlight of the look: it's comfy and perfect for Fall, but it can also be used in Winter. There is also in black, khaki and orange, but I've chosen it in brown 'cause it reminds me of chestnuts <3 - yup, when I pair clothes, I also think of food hahaha! Its style makes it wearable completely buttoned, unbuttoned or keeping only one or two buttons closed so you can wear it as you wish! HAVE YOU EVER BOUGHT ON SHE IN? DO YOU HAVE ANY SUGGESTIONS FOR A NEW WEBSITE TO TRY?